Summary: We herein present a case of an internal carotid artery embolism associated with a hidden internal carotid artery aneurysm. The aneurysm was visualized during successful endovascular treatment of the carotid embolism. In retrospect, the aneurysm was at risk of rupture during the procedure. In the endovascular treatment of cerebral embolism, the possibility that aneurysms are hidden by emboli must be borne in mind. Care should be taken not to injure unidentified arterial walls while advancing a catheter blindly. Endovascular fibrinolysis is a therapy of choice for acute embolic stroke. We present a case of an internal carotid artery (ICA) embolism associated with an ICA aneurysm. The aneurysm was visualized during endovascular treatment of the ICA embolism. Knowledge of the association may lower the risk of endovascular treatment. On August 12, 1996, a 56-year-old man was transferred to our hospital because of sudden loss of consciousness and right hemiparesis. At the time of his arrival, his consciousness level was a score of 10 on the Glasgow Coma Scale (E4, V2, M4). He had severe right hemiparesis, global aphasia, and conjugated deviation of the eyes to the left. Unenhanced CT revealed a hyperdense middle cerebral artery (MCA) sign on the left side, suggesting occlusion of the ICA or the MCA. Atrial fibrillation was also detected on the ECG monitor. Because the onset was sudden and atrial fibrillation was present, we suspected a cardiogenic embolism. We performed cerebral angiography with a view to endovascular fibrinolysis (Fig 1A–E). 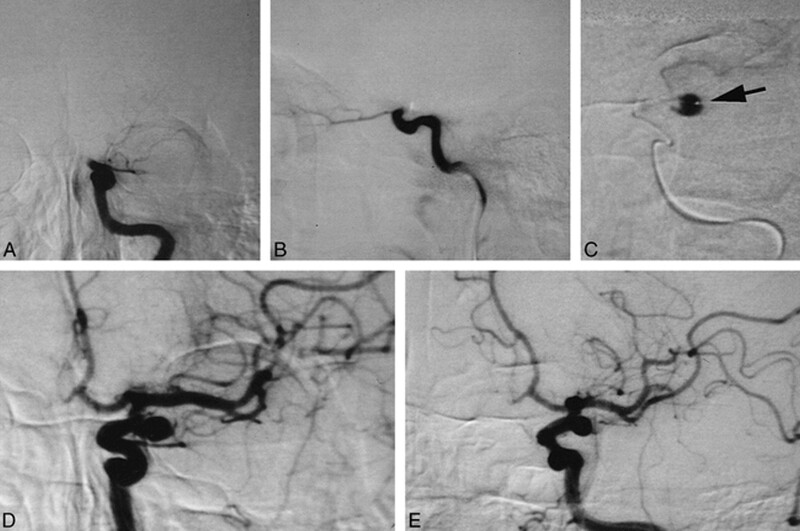 Angiograms of the left carotid artery revealed occlusion of the ICA at the cisternal portion just after branching of the ophthalmic artery (Fig 1A–B). Angiography of the right carotid artery enabled visualization of collateral flow via the anterior communicating artery. This procedure, however, did not show the distal ICA of the opposite side. Vertebral angiography was not performed before fibrinolysis. Because only 3 hours had passed since onset and the patient's symptoms were still severe, we attempted to recanalize the occluded ICA by the endovascular approach. Endovascular fibrinolysis of the left ICA embolism. A, Anteroposterior-view angiogram of the left carotid artery reveals occlusion of the left ICA at the cisternal portion. B, Lateral-view angiogram of the left carotid artery reveals occlusion of the left ICA at the cisternal portion. C, A microcatheter was advanced into the embolus, and the distal lumen was visualized. This lumen later proved to be a saccular aneurysm. Note that the tip of the microcatheter is on the aneurysmal wall (arrow). D, Anteroposterior-view angiogram of the left carotid artery after recanalization of the carotid embolism. E, Left anterior oblique–view angiogram of the left carotid artery after recanalization of the carotid embolism. We gently advanced a microcatheter (Target Therapeutics; Los Angeles, CA) through a guiding 5F catheter into the embolus. A test injection of contrast medium revealed a lumen beyond the embolus, which we thought to be the distal portion of the ICA (Fig 1C). Its course, however, was unusual for the ICA and was too laterally deviated. Urokinase was slowly infused at that position. A soft guidewire (Dasher 14, Target Therapeutics) was also introduced into the lumen to advance the microcatheter further. After several trials, the embolus suddenly moved forward to the MCA, revealing that the lumen we had thought to be the ICA was a large ICA aneurysm. The MCA embolus was finally dispersed with further infusion of urokinase (Fig 1D–E). A total of 42 × 104 U of urokinase was used. A postoperative CT scan showed no evidence of subarachnoid hemorrhage or extravasation of contrast medium. After treatment, the patient recovered from the right hemiparesis except for moderate paresis in the right hand. He recovered from global aphasia, but mild motor aphasia remained. CT and MR imaging studies, performed during the ensuing days, revealed infarction in the perforator area of the MCA, but a large infarct did not develop. Embolization of the ICA aneurysm was performed with platinum coils 2 months later. Although the association of an embolism with an aneurysm might have been coincidental in this case, the possibility that the ICA aneurysm caused the ICA embolism cannot be ruled out. It has been reported that extension of aneurysmal thrombosis caused thrombotic occlusion of the parent artery (1). We, however, consider that our case involved a cardiogenic embolism arising from a different mechanism. First, we observed displacement of the embolus during endovascular treatment, which is characteristic of an embolism. Second, the lumen of the aneurysm appeared smooth after recanalization and postoperative imaging studies did not show any evidence of a thrombosed aneurysm. Third, the onset was sudden and the patient had a risk factor of atrial fibrillation. Hayashi et al (2) reported two cases of MCA occlusion associated with MCA aneurysm, similar to our case, and concluded that in both cases, the occlusion was caused by cardiogenic embolism. In our patient, the neck of the aneurysm was as large as the parent artery and the ICA was angled at this portion. We speculate that the embolus was trapped at this pseudobifurcation of the ICA. Thus, the existence of an aneurysm may have caused the embolism to lodge there. Recent advances in endovascular surgery have led to new choices of treatment for acute embolic stroke (3, 4). Theoretically, rapid restoration of cerebral blood flow with endovascular treatment results in a greater possibility of preventing affected brain regions from developing cerebral infarction. In this procedure, fibrinolytic agents, such as recombinant tissue plasminogen activator or urokinase, are used to facilitate immediate fibrinolysis. Because proximal injection of such agents is not always sufficient to dissolve an embolus, a microcatheter is advanced into or beyond the embolus and fibrinolytic agents are injected there. If the embolus still does not dissolve, mechanical maneuvers to crush it may be used. During the procedure, the tip of the catheter is advanced blindly and this maneuver always carries a risk of injuring the arterial wall, which might result in arterial bleeding. Therefore, gentle handling of the catheter and the guidewire is essential in the procedure. The possibility that aneurysms are hidden by emboli must be borne in mind when conducting such endovascular treatment. Matsumaru et al (5) also reported three cases of angiographically invisible aneurysms that were found after fibrinolytic therapy for cerebral embolisms (5). In one of their patients, a saccular MCA aneurysm ruptured during endovascular treatment, although this may have actually been a pseudoaneurysm caused by intimal injuries. Fortunately, the aneurysm in our patient did not rupture, but we consider that the risk of rupture was high because of the mechanical pressure from the catheter or the elevated intra-arterial pressure from infusion of the fibrinolytic agent. In retrospect, the existence of an aneurysm might have been suspected when we found that the course of the distal ICA was unusual and too laterally deviated (Fig 1C). In addition, we suggest that the existence of aneurysms should be suspected in procedures involving common sites for such aneurysms, such as the cisternal portion of the ICA, the bifurcation of the MCA, and the anterior communicating artery. Furthermore, although vertebral angiography was not performed before fibrinolytic therapy, this technique may have been useful for visualizing the occult aneurysm via the posterior communicating artery. Thus, full examination of collateral routes should be considered to avoid overlooking potentially critical information that would allow identification of an occult aneurysm. In conclusion, we propose not only that gentle maneuvers should be used in the endovascular treatment of cerebral embolism but also that care should be taken not to injure unidentified arterial walls, because an aneurysm may be located behind the embolus. ↵1 Address reprint requests to Nobuhito Saito, MD, Department of Neurosurgery, University of Tokyo Hospital, 7-3-1 Hongo, Bunkyo-ku, Tokyo 113-8655, Japan.